Stranded in Chaos: Starlight on Willow Lake (and giveaway!!) and a winner. WOOT. 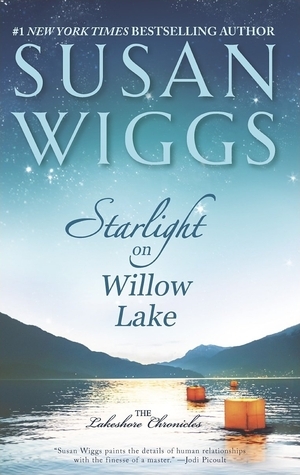 Starlight on Willow Lake (and giveaway!!) and a winner. WOOT. So before I get into my next book review and the next giveaway for my readers, let's announce the winner of the Come Away With Me book giveaway, shall we? YAY!! You are going to love this book so much, I just know it! Let's talk about my next review, which I am also going to give away a copy of this as well, so you'll want your chance to enter. Your odds of winning are super high because not a ton enter so that's awesome for you, am I right? Woo hoo! I am so late to the Susan Wiggs party and I feel like an absolute loser. I actually own a bunch of her books I got at our local library sale because a lot of my friends heavily recommend her, but I have only read a small handful. Bottom line? I need to change that because I absolutely loved this book. So much. I feel the same way about Dorothea Benton Frank books as I do Susan Biggs now. The great thing? That although this is #11 in The Lakeshore Chronicles series, it's a full stand alone, you will be fine jumping right in here. I loved the characters as well. Sure, Mason is kind of a jerk to his mom (though he has his reasons and I can see why he acts the way he does but STILL. That's your mother, you know??) I root for him. I felt from page one that if he had a decent girl he would soften up and see what the beauty in life can do for a person. Then we have Faith, who I immediately adored because she reminded me so much of my own mom. Faith is a single mom with two kids and living paycheck to paycheck isn't even close to an adequate description. She needs this job as caregiver because her and her kids are homeless, but she also won't compromise on standards or taken advantage of. She's also fiercely loyal to her children. Then of course, Alice Bellamy is a heavily handicapped woman after a horrible accident and is unhappy having lost her freedom and independence. She relies solely on a caregiver to live and she struggles with the hardships of losing dignity, privacy and the ability to get up and go when she wants to. But she sees something in Faith, and her children, and though she doesn't make it easy, it's the catalyst for new relationships and futures. The great part about this book? Is that yes, it is a romance and it's everything you want in a romance. It's steamy, it's endearing, it has it's trials, but it endures. Instead, the best part of the book for me is Alice. I used to work with senior citizens and though not totally similar, seeing Alice liven up and transform during the story was similar to what you'd see with lonely seniors who get to volunteer with kids all of the time. It's the basic human connections and engaging someone no matter the barriers that is truly remarkable. It was such a delight to see Alice's journey as well as Faith's. I rooted for Faith so hard and I am so glad she got the ending she did. Absolutely more than deserving. Honestly you guys, this is going to be up there in my top ten reads of the year so far. I better start making my list now and I'm telling you it's going to be SO hard! If you are a Susan Wiggs fan, I'm sure this is right up there with her other books and you won't be disappointed but you will love to be reunited with the little town of Avalon. If you are new to Susan Wiggs, this is a great book to start at, I'm sure you'll be as hooked as I am. You can find Susan on Facebook, Twitter, and her website. Starlight on Willow Lake is available on Amazon as well as Barnes & Noble. But now it's time to giveaway a copy (US/Canada only) to one reader! All you have to do is leave me a comment with your latest read, and leave your email address! I'll draw a winner on Friday, September 11. Good luck! I most recently finished Flight by Sherman Alexie but I'm like 95% through this NetGalley book called The Weight of Feathers. And I'm in the middle of Americanah too. Full disclosure my friend did write this book but it has me spinning- I love this book!! Great review! I'm currently reading Sisterland, and I really love it. It's about identical twin sisters, and they have some psychic abilities that one likes to use and the other doesn't. I really, really hope it doesn't disappoint with the ending. I'll have to keep you posted. Alice is a great character for sure! Adding to reading list, yikes, it keeps getting longer and longer!